Hello and Merry Christmas from my family to yours! I pray that you are as blessed as I am. Today, I want to give you a peek into the Sale-a-bration catalog, with the Heartfelt Blooms stamp set. 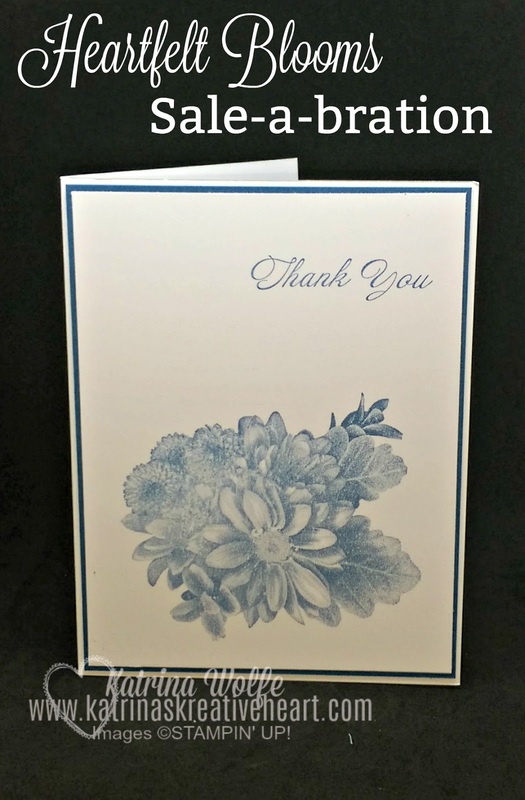 I love the watercolor look of this image with it's monochromatic coloring with light and dark variations in the stamp, it makes it an easy stamp to work with. Here I used Dapper Denim as my ink and layering piece of cardstock between the Whisper White card base and stamped layer. This stamp set will be available January 3rd, free with a $50 order. I'm going to play some more with this to see what other great techniques can be done with this set. In the meantime, I wish you all a VERY Merry Christmas! It's Monday and We Have FREE Shipping!